Long gone are the days when people used a couple of lawn care companies to perform the hard jobs on their properties, the boy next door to mow the lawn, and the family’s kids to pull out weeds from the garden. The new generation of property owners are busy and strive for efficiency. In other words, the logistics, the time, effort, money, and scheduling to have multiple service providers offering different services are unacceptable. The new generation looks for integrated, year-long services. For instance, our lawn care Great Falls VA company offers all lawn, garden, landscaping, and property maintenance services from early spring mulching to heavy winter snow removal. Flexible pricing plans and transparent billing options. Luckily, our lawn care Great Falls VA firm can cover all such needs and more. Installation of water features, fire features, landscape lighting, functional spaces, retaining walls, and more – to mix beauty with utility, as more and more owners want to spend time outside. Customer loyalty is more than just a buzzword used by marketing agencies. More and more, people want to trust their service provider and wants a mutual relationship based on respect and friendship. People want to hire other people, not names or numbers. Young people especially invest money and sentiment in companies that prove genuine respect for their customers, their employees, and their expertise field. As you know, online reviews, customer feedback, clients becoming the main characters in a business’s storytelling are mandatory elements for any business to thrive. 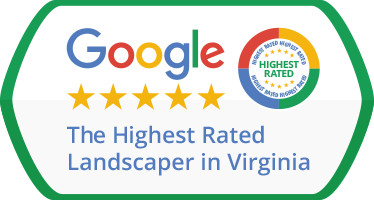 For instance, our lawn care Great Fall VA company is Google’s highest-rated landscaper in Virginia. As a service provider, you should be able to prove you are better in person than you are on paper. As a client, you should opt for companies that come with a trustworthy pool of faithful clients willing to recommend and advocate for them.